Photo details: Canon MP-E 65mm 1-5x macro lens on a Canon EOS D60. This morning I was picking through recent ant literature for a 2008 myrmecological retrospective post when I stumbled on this little gem. 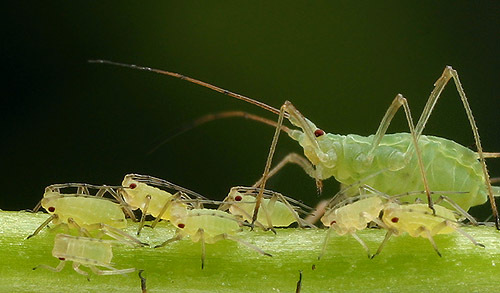 Therefore, bright autumn leaves may have adaptive significance, attracting myrmecophilous specialist aphids and their attending ants and, thus, reducing herbivory and competition among aphids. I hereby proclaim Kazuo Yamazaki the first recipient of an award in his own name, the Yamazaki “Going Way Out On A Limb” Award, for creative lateral thinking in proposing scientific hypotheses. source: Yakazaki, K. 2008. 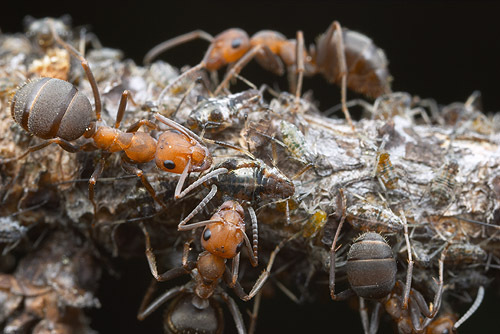 Autumn leaf colouration: a new hypothesis involving plant-ant mutualism via aphids. Naturwissenschaften 95: 1432-1904.